I needed a funnel fast and saw an empty 2 liter soda bottle. 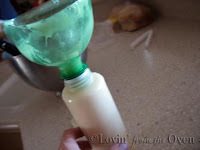 Washed the bottle, cut the top off, and presto ~ an instant funnel! This funnel fits perfectly on a gallon milk jug, which makes mixing a gallon of Chocolate Morning Moo really easy. Here, I'm using it to fill a squeeze bottle of frosting to decorate some cinnamon rolls. I use and re-use it. It washes really well on the top rack of my dishwasher.